Stationary Covert Video Recording Operations will never be the same again! Meet the latest development in cutting-edge covert video recording technology. 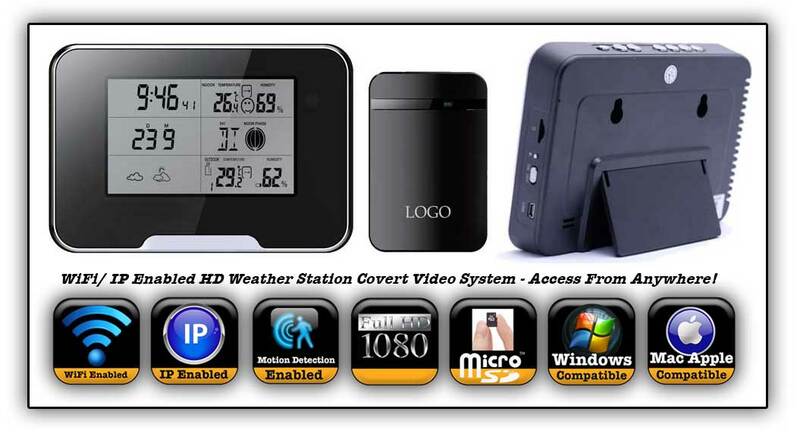 The Advanced Weather Station/Clock HD WiFi Covert Video System is a multi-functional weather station with an integrated 1080P high definition hidden Wi-Fi camera. It can be used as a normal weather station to detect and show both outside and inside temperature and humidity. It displays the time, date, and moon phase. With the high resolution full HD video capture and remote viewing via smartphone, this clock allows you to easily check in at any time. The Wifi functionality allows you to view the live video anytime and anywhere. With a microSD card installed, you can easily record without the need for an always-on computer connection. It's easy to view the recorded footage using your computer, iOS, or Android device. The cloud functionality means there is no complicated router configuration to get you up and running for remote viewing. 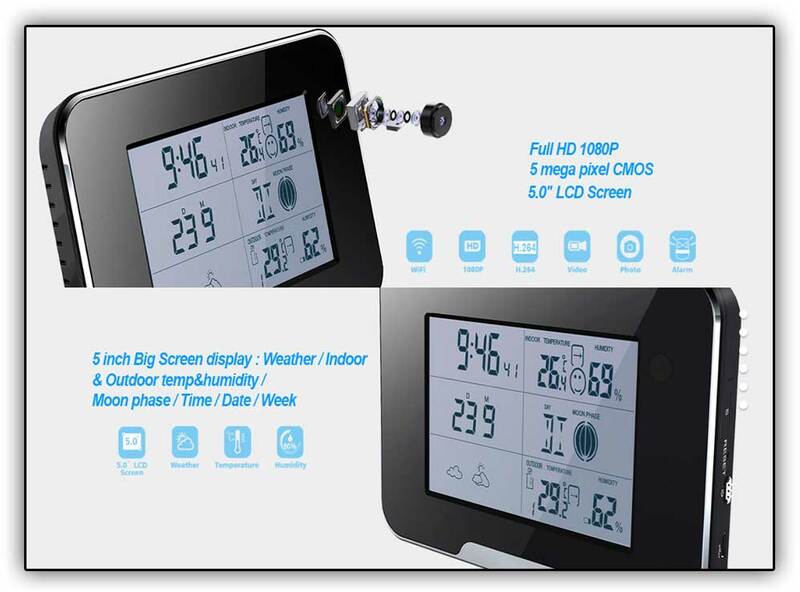 Indoor Or Otrdoor - Multi-Functional Covert Video Recording Ability: The Advanced Weather Station/Clock WiFi HD Covert Video System can be set up inside on a desk, table or shelf and it can also be installed on a wall outside of a building or home. It's the perfect covert video recording system for a home or an office either inside or outside! WiFi Enabled - Your Can Adjust The Resolution And View At Full Screen In Lower Right Corner! Why 1080p HD? With the introduction of full HD resolution, you obtain clear and crisp video results which are courtroom evidence ready! Not only that, the extra resolution gives you a surveillance advantage since you can blow up frames much easier for a positive ID when you need it. Unlike many consumer grade look-a-like tinker toy spy gadgets, professional grade products lets you adjust the resolution recording when you need to! Why IP Enabled And Live Stream? With WiFi enabled ability, you can also live stream your covert video operation as it happens! This lets others in your covert video operation watch the building covert video evidence in real time as it is being gathered. IP enabled also means you can access and control the system from anywhere in the world that has Internet access. Why Advanced Motion Detection: Many covert video camera systems these days have motion detection which means that the camera starts recording when motion is seen. However, most do not offer sensitivity adjustments so you can fine tune the system for individual automatic recording ability. The new generation Weather Station Covert Video Recording System hands you the advanced settings you need to fine tune your automatic covert video operation! Built-in setup allows you to select the specific areas where you want the camera to detect motion, so that insignificant triggers like curtains blowing in the wind or pets running in the bottom of the view do not activate the recording. 24 Hour Schedule Recording : Having some contractors at your house at certain times, a baby sitter or a dog sitter or kids having a party? With this home security camera you can set up a time and date to start and end recoding so you never miss any footage and capture every detail of what really happens when you’re not around without raising any suspicion. Why Push Alarm Notification: You can set this state-of-the-art Covert Video Stealth recording system to push a notification to you so you know when covert video action is happening! Of course, you do not have to use this feature but when you do, you know in an instant that your unit is capturing the covert video recorded evidence you want. • Andriod 4.0 and up. • Apple iOS 6 and up. When it is not functioning as a completely self contain covert video recording studio system you can access from anywhere and anytime, you'll have a very sharp looking weather station clock! Make your surveillance by ordering yours today and be the first to use this new technology. You'll be leaving others in the dust when it comes to the latest cutting-edge technology in covert video operations. We know you will by happy you did!